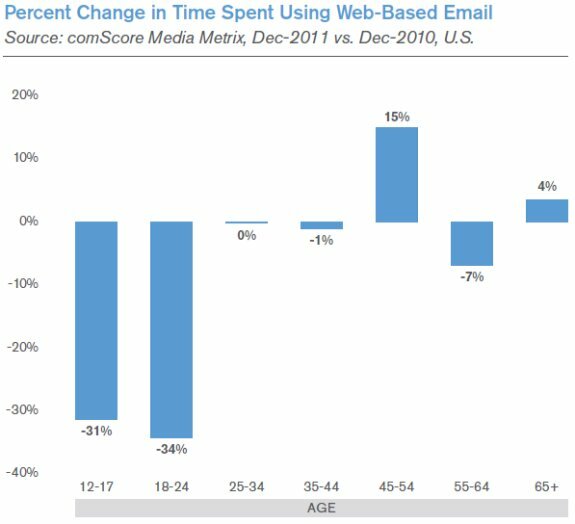 A new study by comScore shows usage of webmail services is tanking hard among teens and young adults. The reason for this is the rise of smartphones and tablets, which push users to built-in e-mail apps rather than web services like Hotmail and Gmail. According to the study, webmail usage declined by -34% for the 18-24 demographic, and by -31% for people between 12-17. The only group that saw much growth was the 45-54, where webmail growth saw a 15% increase, which shows a marked increase in luddism in that segment – or in all the other segments, depending on how you look at it. Email clients existed long, long before the likes of Hotmail and others made it possible to access your mail account from any browser. This offered considerable advantages at the time, since it ensured that you were looking at exactly what was in your inbox at that moment, but many of those advantages have disappeared over the years. Since most smartphones are always connected to the network, email clients are just as effective as webmail was in the days of old, even if you're a long way from home. Still, what looks like progress to people who have grown up on Hotmail might seem like a regression through the eyes of more 'experienced' users.